At least it’s blue. If this doesn’t work, it’s surgery. 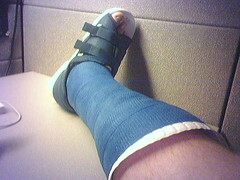 I’m hoping the blue cast does the job. Hello, and HEAL! (smack) OUT! foul leg problem! Sometimes it’s best just to sneak up on it like that. I’m counting on you reviewing this comment and not actually posting it. Found your Geekout Installing Movable Type page via a link in the Six Apart forums. I was hoping to read the comments. Time has fortunately dulled the pains of that experience, and I don’t remember the details of the various make errors I was seeing; I guess those instructions weren’t compatible with G5’s, but I don’t really know. Have you heard success stories from anyone who has a G5 and has followed your instructions? Do your instructions presuppose the reader has enabled PHP or anything else? Should I not be asking you all this while your leg is hurting? here’s hoping the blue will do.